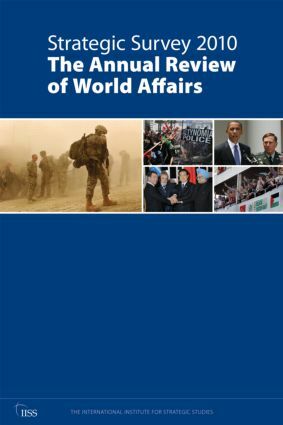 The Strategic Survey is the annual review of world affairs from the International Institute for Strategic Studies. It is an invaluable tool for interpreting world-wide strategic developments and since 1966 has provided the essential one-volume analysis of the year’s key events in international relations for government policy makers, journalists, business leaders and academics. The Strategic Survey's key elements are: Events at a Glance chronology; Perspectives, an assessment of the effect of major events and trends on the strategic landscape; regional and thematic chapters, examining particular strategic policy issues, such as terrorism and weapons of mass destruction, missile defence and the future of peacekeeping. The new edition of the Survey features three specially commissioned essays for 2010 - US Nuclear Policy Transformed, US Defence Policy: Preparing for Change and Europe’s Evolving Security Architecture. Another twenty chapters, written along thematic rather than merely chronological lines, cover developments in particular regions or countries. The Strategic Survey concludes with 'Prospectives', an essay setting forth strategic priorities for the coming year. Also included are thirty-two pages of maps depicting strategically important activity and political change - such as piracy and Russia's new federal districts - globally, regionally and locally. The interplay of political developments and the actual or potential use of military force remains The Strategic Survey's chief concern. Nevertheless, since the end of the Cold War and of the first distinct post-Cold War period, the Institute has recognised that any survey of matters strategic needs to broaden its scope to embrace economic concerns as well.